Egmanton appears in Domesday amongst the possessions of Roger de Busli, but there is no mention of a church or priest. The earliest visible fabric dates to the 12th century and there is evidence from all periods after this. The west tower, built in the 15th century, was likely the final major addition to the church. At some point before the 12th century an apparition of the Virgin Mary appeared to a local woman in nearby Ladywood, which led to the creation of a shrine to the saint at the church in Egmanton. This shrine attracted many pilgrims from far and wide who visited the church, which thus became more than just a parish church. 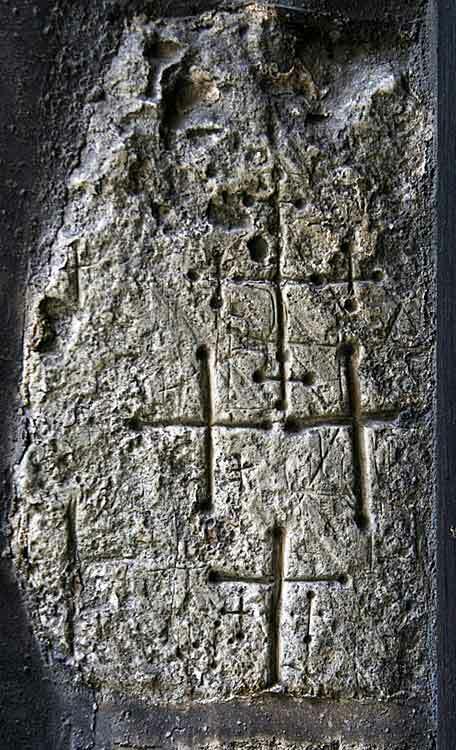 Many of the pilgrims scratched crosses into the stone of the south door and north aisle to mark their pilgrimage and many of these cuttings can still be seen today. One of the earliest references to Egmanton ‘chapel’ (Eggemonton) appears in a charter of John, Count of Mortain dated 1191x1193 that describes the gift of the chapelry of Blyth, with all its appurtenances, which includes Egmanton, to the cathedral church of the blessed Mary of Rouen. In 1252 the Papal Letters record that the rectory was valued at 8 marks (£5 6s 8d) when Master Richard de Chireburne, then rector, was granted licence to hold an additional benefice by Pope Innocent IV. The church was originally in the patronage of the De Eyville (D’Aville) family, the Lords of Egmanton, who acquired the village from Nigel d’Albini in the reign of Henry I, and may have sponsored its construction or at least its development from a chapel to a parish church. It was passed down the family until the reign of Henry III in the early 13th century, when Sir John de Eyville (who would go on to be a leading rebel against the king in the Second Baron’s War) gifted the patronage of the church to the Priory of Newstead, which belonged to the Augustinian Canons. In 1291 the church, still with the priory as patrons, was valued at £10 in a religious tax of that year, a surprisingly small amount given the additional donations the pilgrimages must have provided. In 1315 there was an incident whereby the church and manse were forcibly entered during a vacancy following the death of Roger de Bergh, the previous rector. Archbishop Greenfield issued a mandate to the Dean of Retford to denounce and excommunicate those persons who had committed this crime. The priory at Newstead struggled financially through much of its existence. In response to a plea for financial assistance, Edward II granted the priory a royal licence in 1315, permitting it to appropriate Egmanton Church to the priory, bringing it, and its income directly under the control of the Augustinians. However the appropriation did not take place then due to opposition from the Archbishop of York, William Melton. In the end Papal letters had to be issued in 1326-7 to override his objections and even so it was two more years before the archbishop published the decree of appropriation on 22 June 1329. The reason given for the appropriation is the poor state of the priory due to its distance from any villages and its position along the public road meaning many travellers would use the priory to rest for the night. The church was appropriated but the priory was expected to appoint a perpetual vicar to Egmanton, to construct a hall, chamber, and kitchen for his habitation and to allocate 20 acres of arable and 3 acres of meadow land as well as the mortuary tithes and all other small tithes to support him. The priory also had to pay an annual pension of 6s 8d to the archbishop and his successors. Interestingly, in a writ of 1342, the church of Egmanton was still being referred to as a ‘chapel’ and there is confirmation that it was ‘not alienated by Walter, sometime archbishop of Rouen, his canons or their successors’. In 1341 the church was valued at 12 marks (£8) for the ninths of sheaves, lambs, and their fleeces in the Nonarum Inquisitions – a religious tax of that year. The church also had 11 acres of land attached to it (noticeably less than half what the 1329 decree had ordered), worth 30s a year, and received both tithes of hay worth 10s and mortuary offerings worth 26s 6d; a total of £11 6s 6d. No mention is given of the impact of the shrine and pilgrimages on the church or how much of this income went instead to the priory rather than being used for Egmanton itself, particularly when compared to what was supposed to go to Egmanton’s vicar. In 1428 a later tax showed Egmanton had the same value as in 1291, £10. In 1531 Richard Cuxton, a local gentleman, asked in his will that his soul be given ‘to God Almighty, St Mary and All Saints, and his body to be buried in the Church of Our Blessed Lady of Egmanton’. Such would have been a common occurrence, especially given the holiness imbued by the shrine of the Virgin Mary. Donations were also common – three years after this John Marshall, the rector at South Wheatley, bequeathed 3s 4d to the church. The Reformation brought dramatic changes to the Church in England, and Egmanton was no exception. After Henry VIII seized control of the English Church he made great efforts to close down the priories and abbeys and confiscate their wealth, and as part of this surveyed these institutions to judge their value. Egmanton was valued at £8 13s 4d, which made it the richest of Newstead’s six attached rectories. Although the priory managed to avoid closure initially by paying a heavy fine the delay was brief and in 1539 the priory at Newstead was suppressed. Soon after Sir John Byron (ancestor to the famous poet) purchased the priory along with all its lands and advowsons. Although the priory building remained in the Byron family for three hundred years the church at Egmanton was at some point sold on. The records for 1546 state that Robert and Hugh Thornehill had petitioned to purchase the parsonage of Egmanton from John Bellowes, who had licence to alienate the rectory and church. The Reformation also resulted in the closure and destruction of the Marian shrine at Egmanton in 1547. For the next four hundred years there were no pilgrims travelling to visit the church, which now became just an ordinary parish church. In 1559 the Act of Uniformity was issued by the newly crowned Queen Elizabeth I in an attempt to finally and firmly establish the nature of the new Anglican Church. All clergymen were expected to appear to report their acquiescence with the new Act. Egmanton’s vicar at the time did not appear, along with fifty other priests, and was declared contumacious (a legal term for a refusal to obey authority). However it is likely that soon afterwards these priests eventually complied, as there is no mention of further action being taken against them. Two of the surviving monuments in the church today date to the Elizabethan period. In 1579 an alabaster slab was set up in the chancel as a memorial to Nicholas Powtrell and his two wives. Nicholas Powtrell had been a serjeant-at-law and justice of the assize at Lancaster and had purchased Egmanton Hall in 1554 from Sir Edward Stanhope. He was buried in the chancel at Egmanton. A wall monument also survives from this period. It is dedicated to ‘William Cardinall, one of Her Majesty’s Honourable Counsel, established in the northern parts, 1598’. In 1589 the churchwardens presented that the church walls were in decay, and in 1609 they stated that: ‘we have amended all things that were amiss about our church and churchyard’. By 1620 all seems to have been in good order as they reported that: ‘the ornaments of the church are sufficient, the church yard and vicarage house are in good repair, the sacraments were duly administered last Easter, and other duties orderly performed’, although in the following year they mention that the quire was in disrepair, the default of Mr Ed. Hall. In c.1635 it was reported that a school was kept in the church, that font cover was ‘ill’, the seats were not unform, and the churchyard fence was also ‘ill’. Religious divisions remained in the 17th century. Several inhabitants of Egmanton were presented as papal recusants. These include John Sudbury and his wife, their son John and his wife, George Booth and his wife and servant, Stephen Burton and his wife and Elizabeth Elvys. In 1676 a census was taken, showing Egmanton had 140 people living there, but only one of whom was recorded as a dissenter. The vicar at Egmanton was Ralph Worsey. He was still vicar thirteen years later when he took the Oaths of Allegiance to the new monarchs, William III and Mary II, who had just assumed the throne in the ‘Glorious Revolution’ that deposed the Stuart kings. More records survive from the 18th century. In 1743 the Archbishop of York, Thomas Herring, made a visitation to Southwell and each parish priest was expected to report on the state of their parish. Benjamin Clay was the vicar at Egmanton at the time – he had been installed in 1718. Egmanton at the time had 50 households and 4 of the inhabitants were Quakers. Benjamin Clay resided in Egmanton and gave services in the church twice every Sunday. He also gave the Sacrament five times a year with about 150 communicants, 30-40 of whom typically receive the Sacrament. Most of these figures are typical for the period although giving services twice each week is more than many priests managed. It no doubt helped that unlike many of his colleagues Benjamin Clay was only responsible for one parish, his attention therefore not being divided. In 1764 the new vicar, Matthew Markland, was also the vicar at Sutton-on-Trent and although he too resided in Egmanton he only gave the Sacrament four times a year and did not report giving additional Sunday services. He did request that the Archbishop direct some better repairs to churchyard fences in the country parishes, which he clearly felt had been neglected. 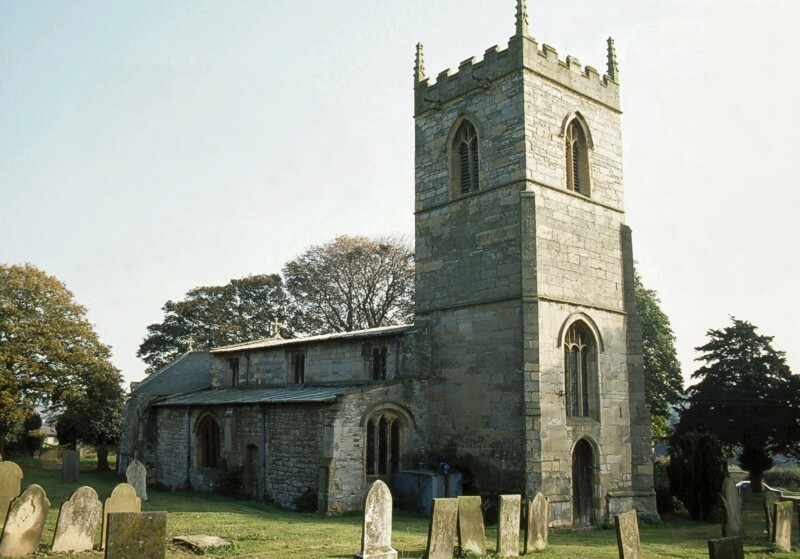 It became the custom in Egmanton for couples who had been married in the church to give a cake to the church bell ringers, who in turn would inscribe their names in the belfry. The earliest recorded names date to 1734 and continued through the 18th and 19th centuries. Sadly, the list was removed as part of the restoration work done at the end of the 19th century. A tablet in the church dated to 1750 states that Christopher Sudbury gave 2 acres of land in the south fields and 2 rood of land in the east fields and finally an estimated 1 acre 1 rood of land in the west fields to the poor of the village. In 1821 Egmanton was enclosed under the Acts of Enclosure. As part of the distribution of land the vicar was assigned 36 acres 36 perch of local farmland. At the time the church already had 63 acres 2 rood 17 perch of glebe land - enough land to make the church well off, but not rich. In 1851 the church’s land was valued at £131 per annum. By 1832 the patronage of the church had passed into the hands of Pendock Barry, esquire. He however sold the reversion to the Duke of Newcastle – who lived at Clumber Hall in the Dukeries - and after his death it passed to the Duke. He and his sons remained as patrons until the end of the century. The church remained active. In the 1851 religious census, when Edward Younghusband was the vicar, the village population was 429 people, and the church had a congregation of 127 people, including 50 attending Sunday School. A tradition of the church recorded from the 19th century is the storing of a large ham at the church. This was kept ready for one of the local families, who were accustomed to bury their dead ‘in ham’ – the ham was eaten at a feast after the funeral. During the 1890s the 7th Duke of Newcastle, a prominent Anglo-Catholic, sponsored a series of repairs and reconstructions of the church. In 1893 the church, particularly the tower, was restored at a cost of £1,500, during which the list of married couples in the belfry was removed. The old bells were sold off and replaced with a new set of three made by J Taylor and Co, Loughborough-based founders. The new bells were presented by Mrs M O Gibson in memory of her parents Francis and Ann Tomkin. Bishop Ridding, in his second visitation in 1892, reported that ‘the two worst ruins promised to be fully restored this year at Egmanton, and Woodborough, and are nearly completed’. In 1897 the Duke hired the Scottish architect John Ninian Comper to lead the restoration work. Comper added a new organ above the south entrance, its casing modelled on that at Freiburg Cathedral, a pulpit based on the medieval one at Ghent, and a very colourful, new rood screen. He also built a new shrine to St Mary, finally replacing the one destroyed in the Reformation. In the wake of Comper’s work, the Duke spent over £2,000 more rebuilding and reroofing the chancel and in decorative work inside the church. Late on in the Duke’s life, sometime before 1922, he sold the patronage of Egmanton to the Society for the Maintenance of Faith. By this time pilgrims had begun to visit Egmanton and its rebuilt shrine once more and there was increasing interest in the church. In 1912 congregations of over 200 people were common and a parish society, the Guild of Our Lady of Egmanton, had been formed to help run local church activities. Between them and the vicars, work continued on improving and modernising the church, helping to attract further pilgrims. The Reverend A H Manning, vicar at Egmanton in the 1920s, sponsored a new sacristy for the church, as well as improving the heating. Manning died in 1928, soon after moving to a church in Exeter, and in his memory villagers donated a 15th century funeral veil and an altar stone. The new vicar, the Reverend Silas Harris, donated a crucifix for the new sacristy. Harris was a big supporter of the shrine and spent much of his time as vicar promoting it. Since its restoration in 1897 pilgrims had been visiting but it was only in 1929, at Easter, that the first organised group pilgrimage took place, with pilgrims coming from Leicester, Leeds, Sheffield, Lincoln, and more locally. A year later the Rev. Alfred Hope Patten, who had restored the shrine of Our Lady of Walsingham, made the trip along with a group of his people and gifted a banner to the church, which is still there today. Since then many other pilgrimages have been made to Egmanton. It is particularly popular amongst Anglo-Catholics – those within the Church of England who emphasise the Catholic side of the Church’s doctrine. The Society of Our Lady of Egmanton continues to organise regular pilgrimages each year, starting with the summer pilgrimage in June, then a youth pilgrimage in July, an Assumptiontide pilgrimage in August, an October pilgrimage and finally an Annual Requiem each November. In 1938 plans were suggested to merge Egmanton parish with nearby Kirton parish, as both were under the patronage of the Society for the Maintenance of the Faith. The plan was opposed by many Egmanton locals, including the Rev. Silas Harris. He argued that both villages could expect to become larger and more affluent (and so more appropriate as separate parishes) thanks to the new coal pits being dug nearby. Furthermore there were villages closer to Egmanton than Kirton. Harris was also an ardent believer in his faith and was concerned about the growing lack of interest in the church, which he saw as a dangerous trend. In his arguments he stated that there had been a conspiracy amongst local dissenters to take over the land in the village, against which the church was a bulwark, and that even then these dissenters had forced down the value of church land by leaving it uncultivated. In 2004 the art conservator Michelle Pepper was brought in to restore the rood screen and the shrine’s icons and decorations that Comper had created over a hundred years before. Her work was partially funded by the Nottinghamshire Historic Churches Trust. In 2014, also part funded by the Trust, the Comper organ case was also restored.